Go beyond the Wall and across the narrow sea with this collection about George R.R. Martin's A Song of Ice and Fire, from A Game of Thrones to A Dance with Dragons. Westeros.org founders Linda Antonsson and Elio M. Garcia, Jr., explore the series' complex heroes and villains, and their roots in the Romantic movement. Wild Cards contributor Caroline Spector delves into the books' controversial depictions of power and gender. 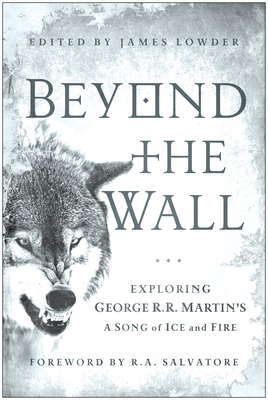 "Beyond the Wall is a compelling read and provides plenty of food for thought when considering Martin’s writing . . . If you’re a fan of the Song of Ice and Fire series, give Beyond the Wall a look. It’s well worth the time." "Beyond the Wall offers bracing takes on the ingrained sexism, brutal violence, and expectations for female characters in Westeros, while reminding readers that critical thinking is key . . . If you feel like some more insight into this crew of flawed, feral, fascinating characters will inform your [Game of Thrones] Season Three viewing, read onand good luck putting it down." "A stunning array of talented creators and critics have been gathered into this scintillating essay collection of analysis/reactions to the world created by George R. R. Martin in A Song of Ice and Fire, and Game of Thrones." "The essays are fascinating and insightful, thoughtful and thought-provoking, and as a whole the collection presents the complexity, depth and richness of Martin’s creation . . . Highly recommended." "A must-have for any A Song of Ice and Fire diehard . . . Whether you be Stark or Lannister, Dornish or Dothraki, Beyond the Wall: Exploring George R.R. Martin’s A Song of Ice and Fire is one book you can trust to feed your Thrones addiction until winter finally arrives." "If anything, this book itself proves that the series has turned academicians on their heads. Geeks, we are finally being legitimized . . . Anyone who is a fan of [A Song of Ice and Fire] should absolutely own this book." "A great read for anyone who loves the books." "Beyond the Wall leav[es] you with plenty of food for thought but also leav[es] you thirsting for more. It's a great temporary antidote to the long wait Game of Thrones fans are undergoing, both for the third season and for the sixth book in the series."